WHEN Chotipat Bijananda was newly married to the daughter of Charoen Sirivadhanabhakdi, the founder of the Thai conglomerate TCC Group and one of Thailand's richest man, he was approached by his father-in-law to join the family business. The patriarch was looking to tap his new son-in-law's extensive deal-making experience as a former senior banker with Deutsche Bank and JPMorgan to help grow the business - a sprawling collection of enterprises in the beverages, property, financial services, consumer goods and agricultural sectors. At the centre of this empire is Singapore-listed Thai Beverage, a maker of beer and spirits that include the best-selling Chang Beer. Mr Chotipat was not quite ready to give up his banking career, but naturally found it difficult to resist the advances of one of the country's most high-profile entrepreneurs, and someone he looked up to personally. His resistance wasn't helped by the fact that he lived in the same building as Mr Charoen and his other children, who all play key roles within the group. "He kept coming to my floor every day to change my mind. When I was in banking I had freedom, and when you join the family business, you can't resign. You can't even retire," he said with a laugh. In a sign of how busy things have gotten for Mr Chotipat since he joined TCC some eight years ago, the 51-year-old spoke to The Business Times for this interview at a Changi Airport lounge barely an hour before he was due to board a flight back to Bangkok. And it wasn't his last appointment before takeoff. What eventually won him over was the chance to work with 69-year-old Mr Charoen, one of the region's shrewdest and most successful businessman, whose rags to richest tale has inspired a generation of Asian entrepreneurs. "He has been working for himself since he was seven years old, so I've learnt a lot about business from him, like how he protects himself from risk. His concept is to begin with the worst situation," he explained. He added: "I work closely with the chairman to formulate a strategy to make sure that we make a move in the right direction to make it a success." He holds the title of adviser to the TCC Group - although he more accurately describes his role as being the company's in-house investment banker, evaluating and working on M&A deals to help the group realise its long-term goal of building a global enterprise. As president of the Southeast Group Co, he also runs the insurance arm of the group, and sits on the boards of various operating subsidiaries. In a more personal role, he has been entrusted with managing the family's private fortune as head of its Family Office - a private investment platform to manage its considerable wealth. 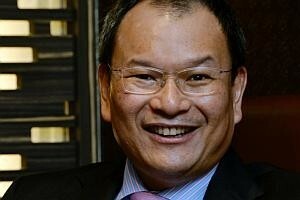 More recently, he joined the board of Singapore's Fraser & Neave (F&N), which TCC acquired last year after a high-profile tussle for control. Mr Chotipat played a key role in negotiating the deal, which he refers to as the "Singapore transaction". "We didn't think that the (Lee family) would sell the shares. They had owned it for many years. This is a very old company in Singapore, and it was not a deal that was easy to conclude," he revealed. He attributes their success in snagging the iconic Singapore firm to "chemistry between buyer and seller". The acquisition also signalled TCC's intention to transform itself into a regional powerhouse by capitalising on synergies between the two groups, as well as the integration of South-east Asia's economies. F&N, which recently celebrated its 130th anniversary, is a regional player in the food and beverage, property, and publishing and printing industries. After joining TCC, Mr Chotipat has had to adopt a much longer-term outlook when evaluating deals compared to his banking days. "As a banker you think about the transaction to help the client be successful. But as now I represent the owner of the business, I have to think about value creation in the long term. Any deal I do I have to think about it in the long term. I have to change my mindset to that of an entrepreneur," he explained. That also means taking a more conservative approach when investing, whether for TCC businesses or the Family Office. He evaluates an investment's risk by first determining the worst case scenario if it were to go sour, and then assessing the quality of the asset. "I want to make sure the investment is in the right direction, that it is safe. As the person running the Family Office, I have to make sure that the family does not invest in any asset that is high risk. We make sure that we understand the business we are in," he said. As for Thailand's current political woes and the risks they pose, he believes that the nature of TCC's businesses shields them from the uncertainty to a certain extent. While there has been some impact on the group's consumer and insurance segments - although the market penetration of the latter in Thailand is still low - the core beverage business has weathered the storm very well. "The economic impact is mainly on the hotel and tourism business, but in the beverage business when people are happy they drink, when they are sad they also drink," he said. But looking ahead, TCC has plans that stretch far beyond its home market of Thailand. Its strategy following the Singapore acquisition is focused single-mindedly on diversifying abroad. "We are aiming for international markets, and to diversify more into Europe and the US and Asia. I believe that in some European countries there is a good opportunity to go in at a reasonable price. We want to be a global player," he said. Such lofty ambitions might justify his heightened workload following his departure from banking and his subsequent entry into TCC. And even if he did want to take a break from work, it's unlikely that Mr Chotipat's illustrious father-in-law would let him. "I mentioned to him that at 60 I wanted to retire, but he told me he is 70 and still working. The work-load is a lot. When I was working with the bank, I used to play golf every week. Now with the family, I play maybe every quarter," he said, chuckling.